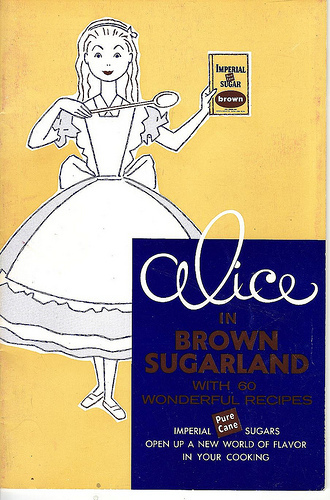 Alice in Brown Sugarland, written and published by the Imperial Sugar Company. Published in 1957 in Texas. Paperback/ pamphlet of 26 pages. The only Alice connection is the name and cover: there’s no theme or mention of her inside. What is inside is a collection of recipes using, of course, Imperial Brown Sugar. Fairly hard to come by: mine came from a US cook book store, and was $9.99 plus p&p. Bargain.